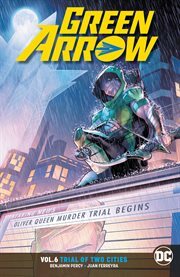 The item Green Arrow, Volume 6, issue 33-38, Trial of two cities, Benjamin Percy, writer ; Juan Ferreyra, Jamal Campbell, Stephen Byrne, artists ; Juan Ferreyra, Jamal Campbell, Stephen Byrne colorists ; Deron Bennett, letterer ; Jamal Campbell, collection cover artist, (electronic resource) represents a specific, individual, material embodiment of a distinct intellectual or artistic creation found in Kent District Library. Oliver Queen may have returned to Star City, but it's not exactly a happy homecoming. His business has been taken over by criminals, and he's facing murder charges that he may not be able to beat. And even a hero's welcome from Red Arrow and Black Canary can't change the fact that Oliver Queen is a wanted man, while villains including Merlyn, Shado, Clock King and more have scores of their own to settle with the Emerald Archer! Plus, Green Arrow's mother, Moira, and his supposed murder victim turn out to both be alive, and Ollie takes his battle with the Ninth Circle to an unexpected place: the depths of the ocean! How will Ollie contend with the mighty cult when he's trapped in their underwater lair? Green Arrow Vol. 6: Trial of Two Cities hits its target from writer Benjamin Percy (Teen Titans) and on-point artists Juan Ferreyra (New Suicide Squad), Jamal Campbell (Nightwing) and Stephen Byrne (Justice League/Power Rangers)!